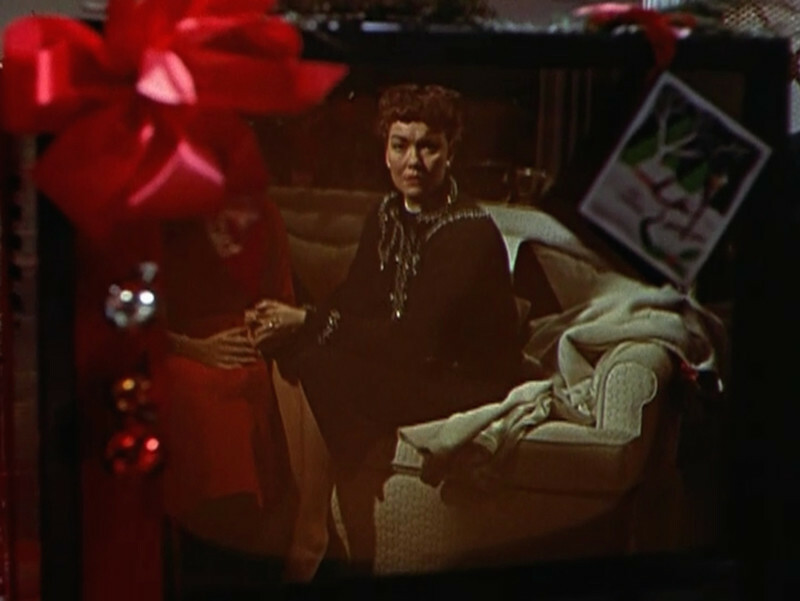 So says the deliveryman in Douglas Sirk’s 1955 masterpiece, “All That Heaven Allows,” as he presents a widow with a brand new television, a gift from her family designed to entertain her within the solitude of her home. Freedom beckons to her in the form of a new relationship, which is forbidden by those closest to her. 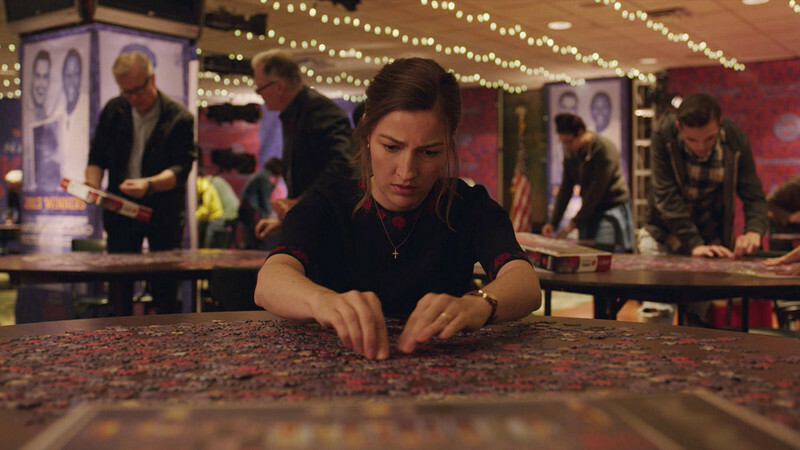 Agnes, the heroine of Marc Turtletaub’s terrific new film, “Puzzle,” finds herself in a similar predicament. Though she is loved by her husband, Louie (David Denman), he consistently belittles her stabs at independence, using lines like “You’re cute” to keep his wife in her place. He’s a reminder of how the people who caution others against “being used” are oftentimes the users themselves. 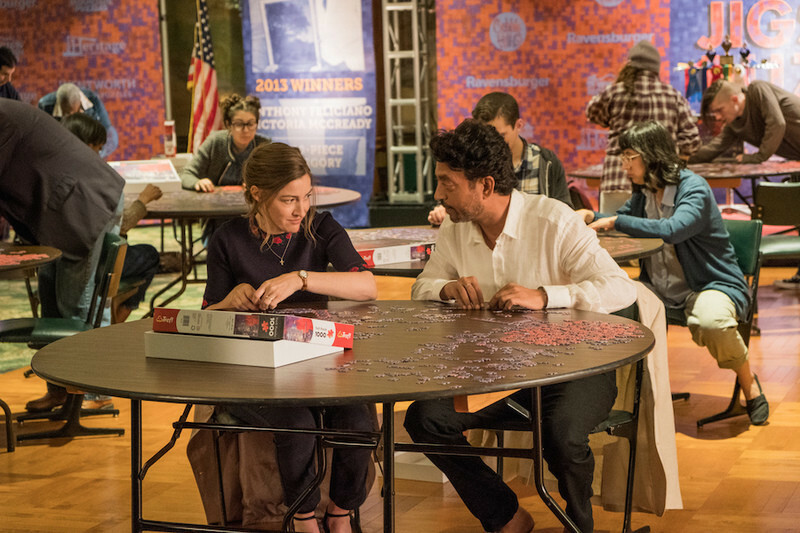 When Agnes discovers her remarkable talent for completing jigsaw puzzles in record time, she strikes up a collaboration with Robert (Irrfan Khan), a puzzler in New York whom she commutes to see on a train ride from her home in Connecticut. This endearing, beautifully acted slice of life marks the second feature directorial effort of Turtletaub, who received an Oscar nomination for producing Jonathan Dayton and Valerie Faris' “Little Miss Sunshine,” a crowd-pleaser that ranks high among my all-time greatest moviegoing experiences. Having amassed a fortune from his previous job as president and CEO of The Money Store, he paid for the entire $8 million budget of “Sunshine,” and has devoted his career in cinema to supporting projects that he finds inspiring. While in town for the Chicago Critics’ Film Festival this past May, Turtletaub spoke with RogerEbert.com about the intuitive process of filmmaking, the missteps of his first feature and why his latest film is so close to his heart. Both “Little Miss Sunshine” and “Puzzle” are about achieving a deeper victory that transcends the American definition of winning or losing. What attracts you to films that explore this theme? I’ve been making movies for about fifteen years on the producing side—now on the directing side—and I’m drawn to movies that have something important to say while always entertaining the audience. The message can be as simple as, “Do what you love and don’t worry about the results,” as in “Little Miss Sunshine.” In the case of a film like “Loving,” we were talking about interracial marriage in the South and changing the laws in the country. When people hear about this movie, they figure it’s all about jigsaw puzzles and that it will climax in a big competition. But it’s not that at all. Just as “Little Miss Sunshine” turns out to be about much more than a beauty pageant. Right, it becomes something completely different. In fact, the puzzling aspect of the story is minimized—it was minimized in the script, and it’s minimized in the movie even moreso, because it’s not about that. It’s about the relationships that exist between the characters, and that’s what drew me to it. Were you first introduced to the story through Natalia Smirnoff’s 2009 Spanish-language film, “The Puzzle,” upon which it is based, or through the screenplay by Oren Moverman and Polly Mann? I had not seen the Argentinian movie. A producer I knew from years ago, whom I hadn’t seen in a while, had gotten the rights and sent it to me with the screenplay. It was a rare instance of receiving a screenplay in which 85 or 90 percent of it ended up on the screen. It was that well-written. I’ve had that experience with only a handful of screenplays in the last fifteen years, including the one you mentioned, “Little Miss Sunshine.” “Sunshine Cleaning” and “Safety Not Guaranteed” were examples of movies where the screenplay was really wonderful right from the beginning, as was the case with Jeff Nichols’ script for “Loving” and Liev Schreiber’s adaptation of “Everything is Illuminated.” That sounds like a lot of screenplays, but keep in mind that these were found over a long period of time. I was looking for a directing vehicle, and after my friend sent it to me, I was immediately taken by it and I loved the subject matter as well. The film is dedicated to your mother, Beatrice Ann. How did you see her reflected in the script? The story is about a woman over the age of 40 who finds her true voice for the first time. Agnes is a wife and a mother, but she is also much more than that, not to diminish those roles in any way. In my own life, I was raised by a woman who doted on her husband and her only son, so when I read the screenplay, I was like, “I know that woman. I was raised by that woman!” That’s why the script touched me, but what moved me even further was that this woman leaves suburban Connecticut, goes down to New York, walks into Grand Central Station and her life opens up. When I read that scene in the script, my first thought was, “That’s going to be expensive.” [laughs] But my second thought was, “I want that scene,” because it takes us from a small, fairly cluttered house in Connecticut down to this vast urban space that provided a great way to visually show how her life is opening up. If Agnes and her family didn’t have iPhones, you’d swear they were living in the 1950s, considering the repressive traditions of their household. Yeah, that’s really astute. In the first minute or two of the film, we shoot Agnes in silhouette. She’s wearing a dress that could’ve been from another generation, and it kind of blended into the wallpaper. That was intentional because she was living in the house that she had been raised in by her father, whom she had doted on before he died. These events precede the film, it’s all backstory. We used a lot of smoke in the house and old furniture to give the sense that the house was sort of stuck in time. Then when she receives the iPhone as a birthday gift, you go, “Oh, this is today,” and things begin to change. At the beginning, Agnes has no use for it, but by the end of the movie, she’s Googling everything. Jane Wyman in "All That Heaven Allows." In a way, the family’s gift of the iPhone has the same function as the television in “All That Heaven Allows,” confining her freedom in a box. I didn’t see that movie, but the phone does have a similar function. The younger son, who’s quite humorous, basically says to his mom, “The whole world is in here, when are you going to enter the 21st century?” And of course she does. But in moderation. She’ll also take time to look out the window. I was struck by how the Buddhist qualities of puzzle-making are reflected within the narrative. Certain relationships come together for a brief moment of perfection before scattering. That’s lovely. Can I interview you? [laughs] Of course, you have to think about how to make a movie in which there are jigsaw puzzles visually interesting. The film isn’t primarily about jigsaw puzzles, but it is a key element, so you have to deal with it, though the story was never going to culminate with a big tournament of some sort. I think that the answer, really, is that the screenplay was that tight. The whole was greater than the sum of the parts, and hopefully people will take that from the movie. Was Kelly Macdonald always in your mind for the role of Agnes? She is such an ageless actress. Yeah, I love Kelly. She is ageless, and you also can’t pin her down. I first really began to appreciate her years ago in a movie called “The Girl in the Café” with Bill Nighy. It was made-for-TV, but it was really good, and I went, “Who is she?” I had forgotten that I had seen her years ago in “Trainspotting.” A few years later, I saw her in “No Country for Old Men,” where she plays a Texan, and I was like, “Wait, this woman is Scottish!” She’s great with accents. Then when her role in “Boardwalk Empire” came along, I started to connect the dots and went, “Wow, she is so versatile.” I was thrilled to have her in this movie. It was actually my producing partner who said, “Have you ever thought about Irrfan Khan to play the man Agnes meets in New York?” I didn’t know Irrfan personally, but I had seen his work in a little movie called “The Lunchbox,” in which he was brilliant. But most people know him as the Indian guy in big American movies like “Jurassic World.” He’s not often cast in a role like this, and he’s one of our great actors. I was really fortunate to have them along with David Denman. They were a wonderful cast, and they made my job pretty easy. Agnes’ penchant for finding patterns in the randomness of life—such as the recurring name of Maria—is a key skill for puzzlers. As a filmmaker, is it imperative to be open to those connections? Yeah, I think that occurs whenever you make a film. You find things that weren’t in the script as you’re making it, and even after you’ve finished it, which is really interesting to me. Even after I’ve seen the film so many times, I see connections and moments of foreshadowing that I didn’t even know were there. Maybe I intended them unintentionally, but I didn’t necessarily know that I was doing it at the time. Those connections start to occur throughout when you really look closely at the film. Is that why you only do a few takes? Yes. I had directed one other feature, which was a learning experience for me. Well, it’s hard to see. It was my film school, as I put it. I rehearsed the hell out of it, and I think I took some of the life out of the performances. There are some really good parts of it, but overall, it could’ve been a lot better, and that’s because I drained some of the life out of the film. After that picture, I directed a short that I didn’t rehearse. Instead, I made adjustments after the first or second take, and I had the same approach when making “Puzzle.” Especially when you have consummate actors, that type of direction allows them to bring in what they’ve prepared without me mediating it or interpreting it. We talk about it, but then they bring it in themselves, and I will always work that way. I love working that way. What particular ideas did the actors bring to the film? One of our famous directors—I won’t tell you who it was because the point is more important than the person—once said, “Every time I cast an actor, it’s like a little death.” What he was saying by that, of course, is, “I have an idea of how the actor should portray this role, and once I cast someone, it’s going to be different from what I’ve envisioned.” I take a different attitude and say, “Every time I cast an actor, there is a birth that occurs.” Something that I’m not expecting will occur before the lens, especially when I’m working with great actors. There are all sorts of things that happened during the movie that were completely unexpected, everything from the delivery of lines to entire performances. I never could’ve anticipated how Irrfan was going to play that role. I haven’t seen anything like it. He’s just one-of-a-kind and it’s completely unlike other roles he’s played, which is why he is such an excellent actor. And then David Denman suggested to me that we shoot two different endings. During the writing stage with Oren Moverman, we had considered several different endings for the movie. Then here is an actor coming to me saying, “I’ve been thinking about the movie and maybe you should end it like this,” He was spot-on in what he said. So we shot two different endings, and I think at the end of the day, ended up with the right one. Chris Norr’s cinematography makes intriguing use of glass surfaces. When Agnes gazes at her reflection in a train window, it feels as if she’s looking at a completed puzzle. He’s a great cinematographer. I hadn’t worked with Chris before, and I will continue to work with him. I think he’s really brilliant. For that shot you mentioned, I wanted to incorporate the reflection of the moon, which is a recurring visual in the movie right from the beginning. Agnes’ line to Louie, “You don’t own me,” also serves as the unofficial anthem of “The Handmaid’s Tale.” Would you say it’s also reflective of the #MeToo and #TimesUp movements? I had no idea that we were going to be of the moment. Our focus wasn’t on Agnes’ gender, but rather that she is a person who finds her voice. That always interests me, especially if it can be as specific a person as this and as unique a world as this. It just so happened that this character happened to be a woman over the age of 40, which I think is really important today. Did Norman Lear and “All in the Family” serve as an influence on the projects you tackle? Yes! I saw Rob Reiner recently. We were both at a festival in Dallas, and he had a movie screening there. Norman’s show was about an even more extreme family, but yeah, that was one of those programs that changed television in many ways. Though I disagreed with David’s character on many subjects, I found myself feeling for him in the same way I felt for Archie Bunker. What I hope people take away from this is that every character is sharply drawn, but they are multi-faceted. They are not stereotypes, and that was true of Louie. David Denman played him so beautifully because it’s a tough line to walk. You find the flaws, but you also see that there is real heart there. There’s an episode of “All in the Family” entitled “Edith Breaks Out,” where Archie’s wife volunteers to be a “Sunshine Lady,” working at a home for seniors. The show has the same spirit as “Puzzle,” with Edith arguing that what she does with her time is her business. Right, and you don’t even know where Agnes is going to end up, in some ways, which is what is beautiful about life. She has found out who she is and is now finding out what her purpose is and where she is supposed to be going next.